Let’s talk Big Game hunting; going after those accounts that, when you land, would dramatically increase your sales and profits. This month’s example is a great case study in Big Game Hunting in the business-to-business (B2B) space. The owner, Michael Nguyen, recently bought the company, Produce Results. They are a marketing agency in north Texas. Immediately upon taking ownership, he decided to move all his marketing efforts to small banks and credit unions in Texas. He found they were more profitable, and much easier to worth with than most of his other clients. He came to me to get help with his direct mail marketing to these new accounts. I’ve been working one-on-one with Michael since June and we’re already seeing some amazing results (to learn how to work directly with me visit 3dmailresults.com/meet). Michael told me his sales process, once in front of a qualified prospect, was outstanding. All he needed was more appointments. Well, I KNEW we could help with that. We started with a test list of just 165 banks and credit unions. The first step was the 9×12 express envelope. The ONLY goal is to have the CEO or head of marketing set an appointment, that’s it. As I said, Michael does agency work for banks and credit unions. His transactions are large, $5,000-$10,000 for a small account, and $50,000+ for large accounts. These are renewable contracts every year. With that in mind we were able to bring some serious fire power to his direct mail. We’ve since deployed to a larger list of around 450 and hope to have similar results to report back on next month. I encourage you to stop reading now and read the entire package. This is a perfect example of the “Dream 100” marketing campaign. The idea is to target your best potential buyers. These best buyers buy more, buy faster, and buy more often than other buyers. These are your ideal clients. No matter what else you are doing, you should have additional effort to capture them. If is your program for targeting your 100 (or whatever number is appropriate) dream clients constantly and relentlessly until they buy your product or service. However, targeting your Dream 100 prospects is only the start. Now you need reach out to them. You need an organized, consistent, and relentless program to win over as clients for life – no matter how many times they tell you they’re not interested. And that’s the key: you are actually expecting and planning for these dream prospects to say no several times, and these rejections will not cause you to give up. Massive and diligent follow-up can penetrate just about any company if you are determined. Choose your Dream 100: All marketing campaigns start with the list. Make sure you are clear on your criteria for your dream list. Choose the mailers to send out: I’ve found that one of the best ways to get noticed by your Dream 100 is to send 3D mail every 2-4 weeks. Ideally you want the gift to be useful or fun, something they’ll play with or take home to their kids or grand-kids. Conduct your Dream 100 follow-up calls: After every mailing you’ll need to follow up with each Dream 100 prospect. Conduct your Dream 100 digital touch points: With all the digital platforms we have now, you’d be foolish to not use at least some of the ways to reach your dream prospect; Facebook, LinkedIn, etc. Guarantee Your Client or Prospect Reads Your Letter with Our “Faux” Express Envelopes! I absolutely LOVE using the fake express envelopes, pictured on this page. They come in 6 x 9 and 9 x 12 versions. What’s great about these envelopes is the postage rate is the same as regular first-class mail. The 6 x 9 version mails for just $0.50 under 1 oz. The 9 x 12 version mails for $1.21 (the envelope is about 1.2 oz. on its own, with no inserts). You can decrease your postage cost by 35-50% if you use pre-sort mail. If you need help with that, just give us a call, (888) 250-1834. All our express envelopes are 15% off for either the 6 x 9 or the 9 x 12 versions! 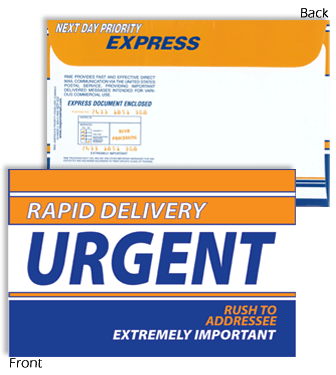 Just visit our express envelopes page on our website. Choose the style and size you want, then use Promo Code express15 upon check. You can call to order, 888-250-1834 and ask for Tara. She’ll be able to answer any questions you have and take your order quickly, right over the phone. We’re open 8AM to 5 PM PST, Monday through Friday. See all the styles and order yours right here.